25 January 2016, at 12:00a.m. 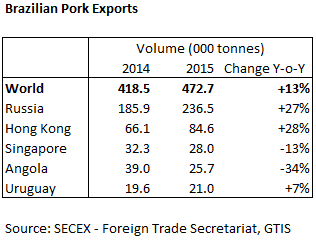 BRAZIL - There was a strong growth in the volume of pork exported from Brazil during 2015 – up 13 per cent on 2014. There was a drop in exports to Russia in the first quarter of the year. Russian exports were behind expectations during this period, exacerbated by difficulties in the Russian economy, largely driven by the weakening price of crude oil. However, Russia did return to the buying table in the rest of 2015 and there was a large peak in exports during the second half, a year on from the Russian import ban of Western foods, imposed over the situation in Ukraine. Brazilian pork became extremely competitive on the global market due to the weakening of the real against the dollar, attributed to the recessive Brazilian economy. Whilst this helped increase the volume of pork exported to a range of markets, the effect on value was very dependent on the currency involved. In domestic currency, the value of exports was 16 per cent up on the year, as prices rose modestly. However, in US dollar terms, value was 19 per cent lower than 2014, as prices fell by 28 per cent. The 2016 outlook is that exports are forecast to continue to grow. Brazil is looking to explore exporting to other markets, including Japan, China and Mexico, in 2016 to avoid an over reliance on Russia. This export development will be fundamental in 2016 as production is set to grow. There is an expectation that domestic consumption will also increase due to high beef prices but this will still be behind growth in production. Whilst the weakness of the real has proved beneficial for the global competitiveness of Brazilian pork, it has caused an increase in the cost of imported vitamins and medicines for pigs and therefore started to squeeze producers’ margins. However, this hasn’t overly deterred producers who are still looking to capitalise on the growing export market, low feed prices and sustainable domestic and export prices.